Dracula fangs sold separately. Shoes and trousers not included. This Prince of Darkness sleeps by day and rules the night with his wiley vampire ways! Not the Twilight style vampire, but the original Dracula, striking fear into the hearts of all he lays eyes upon. Or of course it could be the less threatening Count, from Sesame Street. 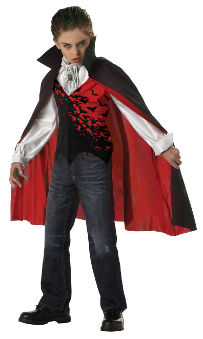 That's the beauty of this Prince of Darkness costume, its versatility is as high as its appeal!